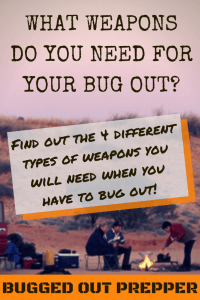 What Weapons do You Need for Your Bug Out? 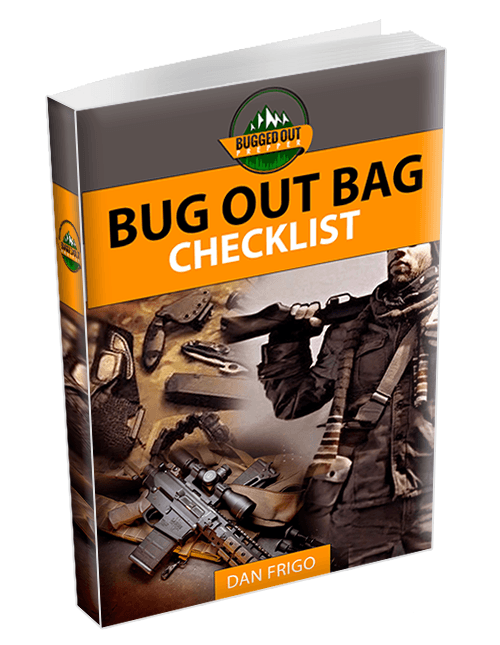 The one area of a bug out bag that seems to garner the most controversy is weapons. That’s kind of funny in a way, because the conflict isn’t so much a disagreement between the liberal anti-gun crowd and the conservative pro-gun crowd, but rather between conservatives discussing what types of weapons you should take with you on a bug out. The thing is, few liberals even bother putting together a bug out bag, even though Big Brother has told them they should have one. They’re all counting on the government taking care of them, while the conservatives are counting on themselves. So, even if a liberal were to actually put together a bug out bag, you can be pretty much sure that they’ll only put in it what the government tells them to, like good little sheeple. For the rest of us, deciding on what weapons to carry is a major decision; not so much because we don’t have weapons and want to keep the cost down, but because we have too many weapons and don’t know how to limit ourselves. But limit ourselves we must, or we’re going to be so burdened down, that we won’t be able to walk. Bugging out lays several weapons requirements on us, both in the area of personal protection and being able to hunt for our food. So, we want to make sure we get the best possible service out of the weapons we choose. We especially want to make sure that we choose weapons which will serve as many needs as possible. Since we have to keep ourselves alive, before we can accomplish anything else, the first weapon we need to choose is our personal defensive weapon. For this, I’d recommend choosing some sort of pistol. I personally prefer semi-automatics in this role, as they hold more ammo and the magazines can be changed quickly. Revolvers are nice, but firepower is more important. This is the weapon you need to be the most familiar with. That’s because when all is said and done, this is the one you are counting on to keep you alive. So, while you want the biggest caliber you can fire, you want to make sure that you limit yourself to what you can fire comfortably. If you feel that a gun is beating up your hand, you’re not going to enjoy shooting it. Scales down a bit to something that you feel comfortable with. The other consideration here is weight. A pistol hanging off your belt all day can start to feel pretty heavy. You’ve got to tighten your belt more to keep it in place. That can get uncomfortable too. So, rather than getting a piece of artillery that looks like it needs its own wheels, get one that feels more reasonable hanging on your belt. The second weapon you need to think about is a long-range weapon. Now, when I’m talking long-range, I’m not talking 500 yards. You really don’t need a hunting rifle that will allow you to hit a bighorn sheep on the mountainside opposite you. What you need is something that will work out to 100 yards or so. AR-15 – The AR-15 is a very versatile platform. While normally thought of as a military-type firearm, it is also an excellent hunting rifle for mid-range shooting. With the right optics and replaceable magazines, it’s also an excellent firearm to have if you end up in any firefights. Hunting Rifle – If all you have is a hunting rifle, then by all means carry it. However, of all the options there are for a long range weapon, a hunting rifle is actually the least versatile. If you have a scope on it, it’s hard to use at close range and if you don’t it’s hard to use at long range. Shotgun – After all these years, the shotgun is still the most versatile firearm on the market. You can use it effectively for everything from short range home defense to hunting at shorter ranges. Firing slugs, a shotgun can be used for hunting out to about 75 yards, maybe even 100 yards. In a firefight, firing buckshot, it’s the most devastating gun you’ll have. Bow – Don’t discount the idea of using something other than a firearm for your long range weapon. The bow is actually one of the few weapons which has effectively survived the invention and development of the gun. That’s because of the combination of its range and accuracy. There’s one other thing a bow has going for it, that a gun doesn’t, it’s silent. Of these options, I would carry a shotgun for its versatility. I don’t have any plans on playing sniper, so I don’t need a really long range firearm. However, I do plan on being able to defend my family and put food on the cooking fire. A shotgun gives me the widest range of options for this. I’d also carry several different loads for the shotgun, so that I could take advantage of its versatility. The knife is the most versatile survival tool there is. In fact, if I had to go out in the wild with only one piece of equipment, I’d pick a good knife. With it, you can do a wide range of things to help you survive. Without it, you’ll have to make something that you can use as a knife. However, the knife isn’t just limited to being a tool, it’s also a good hand-to-hand weapon. If you get into a fight at that short a range, a knife would probably be even more effective than a pistol. Of course, like the pistol, you’re going to have to practice with the knife and learn how to use it effectively. This last weapon isn’t an absolute must, but I think it’s a good idea, especially if you carry it like I do. For me, my melee weapon is a staff. My staff is metal capped, with spikes, at both ends. Not only does it serve as a walking stick, but it gives me a weapon that is in my hand all the time while I am walking. If anyone or anything tries to attack me, I’m ready to strike back. The advantage of a melee weapon over a knife is that of distance. With a knife, you have to be right in their face to use it. A melee weapon gives you an arm’s length more distance. That extra distance can be decisive in giving you a warning of what they are going to do in a fight. A lot of people like a tomahawk for a melee weapon. This gives them a combination melee and throwing weapon. At the same time, it can serve as a hatchet for cutting wood. While I like tomahawks, I don’t carry one. I prefer to carry a survival hatchet, which includes a hammer and a pry bar. That’s a more useful tool. But the problem I have with tomahawks isn’t that, it’s that most people don’t carry it in their hands; they have it strapped to their packs. So, it’s not available when they need it. To me, that makes it less useful as a weapon than just about anything else.